All of this is prompted by the pending sale of Cotter Ranch Tower to BancFirst. 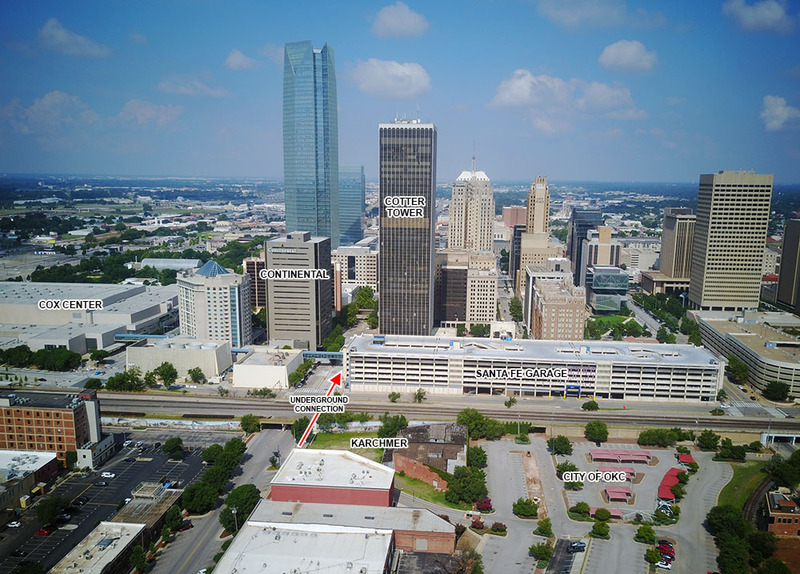 As OKCTalk exclusively reported, BancFirst was notified several months ago that they were the winning bidder after offers had been solicted by CBRE, a commercial real estate firm hired by the trustee of the Cotter bankruptcy. The building was placed into bankruptcy after James Cotter passed away and a battle between his heirs ensued. Now, BancFirst is planning to buy half the immediately adjacent Santa Fe Garage with Continental Resources purchasing the other half. 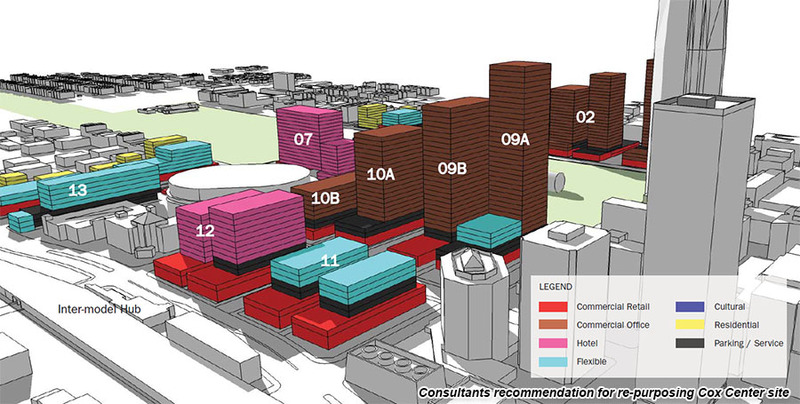 And because half of the 1,518-space garage would not be enough for for all the tenants should BancFirst fully lease the 36-story tower, they are also asking the city to facilitate another parking garage very nearby. The City of Oklahoma City owns the 1,518 space garage at 101 N. EK Gaylord free and clear and it generates approximately $2.9 million in revenue each year. It's the largest of the city's parking structures. Continental currently leases several hundred parking spaces in the Cox Center to the south of its headquarters at 20 N. Broadway. After the new MAPS3 convention center is completed in 2020, the city has talked openly about demolishing the Cox Center and its 947 parking spaces in aid of expanding the central business district. Continental is concerned about securing parking for their employees when the Cox is demolished and BancFirst doesn't want to risk buying a huge building in the middle of downtown without being able to control parking for all their tenants. According to records filed as a part of a jobs incentives program with the city, Continental employs just under 700 workers. The energy company led by Harold Hamm had offered the city $15 million last year, but an agreement was never finalized. Chase Tower and Continental's building are both connected to the Santa Fe Garage via The Underground, downtown's extensive pedestrian tunnel system. As had originally been considered in 2013, the city is ready to sell Karchmer land to the north of his property on Main Street in Bricktown to facilitate a new, large parking structure which would help service the needs of that district and downtown in general. The proposed Memorandum of Understanding (MOU) includes provisions that Karmcher would build around railroad right-of-way that would be needed to connect Santa Fe Station – which is planned as a multi-modal hub – to points east, mainly Midwest City and Tinker Air Force Base. This issue was raised by rail advocates when Karchmer unveiled his plans in 2013. It is unclear how much right-of-way would be provided in the agreement with the city but before any such sale or design was approved by the necessary public bodies, those issues would be made public through agendas and filings. The MOU aslo would require Karchmer to connect the garage to the city's Underground system, most likely along Main Street which would provide a direct link to the Santa Fe Garage, which is on the eastern edge of the city's pedestrian tunnel system. In 2016, Karchmer had sought design approval for a another large parking structure in the heart of Bricktown at Sheridan and Oklahoma, but that project appears to have completely stalled. These matters have yet to appear on any public documents but OKCTalk has learned it will be on the city council agenda for July 17, their next meeting. Due to the late notice and complexity of the pending deals, a request was made by a member of city council to delay the matter until the following council meeting on July 31st, which was subsequently denied by City Manager Jim Couch. Couch recently met with council members in small groups (less than 5 to avoid a quorum and having to comply with state open meetings and records laws) and explained that BancFirst would not buy Cotter Ranch Tower unless they had the parking garages locked down for their current and future tenants. These small meetings with the council are common practice by Couch and Alliance for Economic Development head Cathy O'Connor. Dozens have taken place over the years, almost always regarding topics deemed as economic development. 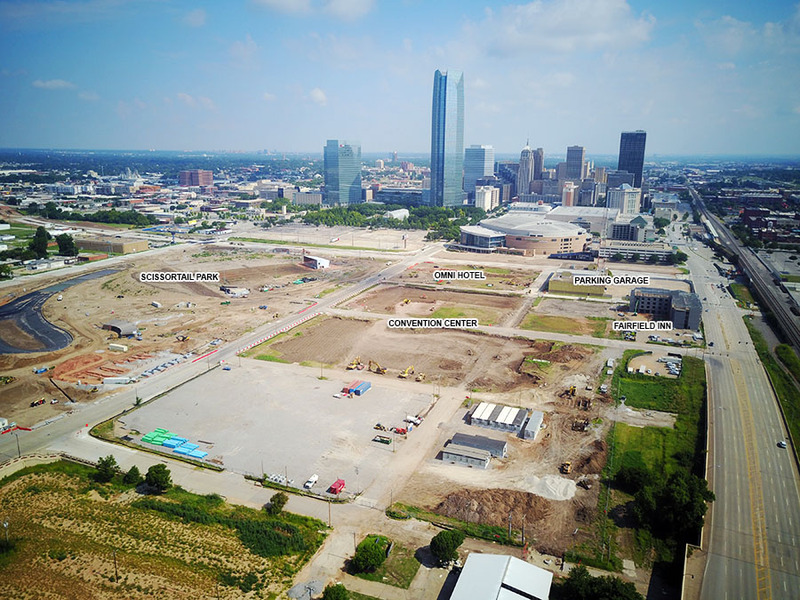 OKCTalk did spy the item “Santa Fe Parking Garage Project” under the heading “Tax Incremement Districts (TIF) 2&3, Projects Under Design” on the latest General Manager's report of the Economic Development Trust. An open records request was filed with the city on 6/19 but we were told to submit our request through COTPA, even though they are a city agency. Calls to COTPA were not immediately returned. Councilman James Greiner also confirmed a recent meeting with Jim Couch where the sale of Santa Fe Garage and the construction of a new Karchmer garage was discussed with specific numbers presented. As there is no recording of these meetings, Greiner could not recall the exact figures presented and said he would not be sure of many of the details until they are included in the next City Council agenda. The purchase offer for Santa Fe comes at a time when the city and its agency the Central Oklahoma Transportation and Parking Authority (COTPA) are anxious to build a new $35.2 million garage for the new convention center. Parking is also a requirement for Omni Hotels to proceed with building a $234 million convention hotel. The city is providing $85.4 in tax incentives in addition to building the garage. Initially, the city could not finance the convention garage because COTPA was heavily leveraged from having recently built the Arts District Garage which opened in 2014 near City Hall. As of the last available COTPA report, the new garage is only operating at 57% occupancy. COTPA's budget for next fiscal year shows a debt service on the Arts District Garage of $1.5 million per year. Ultimately, $9 million in MAPS 3 money was given towards this convention center garage in order to get it built and comply with the terms of the Omni agreement. Just recently, Cathy O'Connor was quoted as saying the city was now looking to make the convention garage even larger, which raised questions due to the previous difficulties in finding the funds for the original scope of required work. In his meetings with city council, Couch told members the sale of the Santa Fe Garage was needed to help finance the new convention garage. Couch also told the council that BancFirst needed to lock down the parking deal very quickly due to the sales contract on Cotter Tower. According to documents filed in San Antonio bankruptcy court, BancFirst has 30 days to conduct due diligence review. After that 30 days the only way they could walk away from the sale would be to forfeit their escrow deposit, which is $100,000. There are no provisions on contingencies in the Purchase and Sales Agreement (PSA) for Cotter Tower that mention parking. The documents also disclose that BancFirst was notified of their winning bid on April 30th of this year. It is not known why approval by the council is just now being sought. The PSA states that BancFirst has no financing contingency and has the financial resources to close the purchase without needing a loan, which was one of the reasons their bid was selected from 7 finalists. It appears the desire to rush this for approval stems from BancFirst's desire to have a binding agreement with the city prior to the expiration of their 30-day due diligence period. As the Cox Center parking will not be going away until 2020 at the earliest, there does not seem to be any urgency behind Continental's interest in the purchase. Is this a good deal for Oklahoma City? Before selling an asset the city is required to receive independent appraisals. However, the Santa Fe Garage is owned free and clear and generates almost $3 million in revenue each year. Also, parking rates keep going up in the city's core and that trend is likely to continue. In the past decade, the city has sold several parking garages to private businesses. 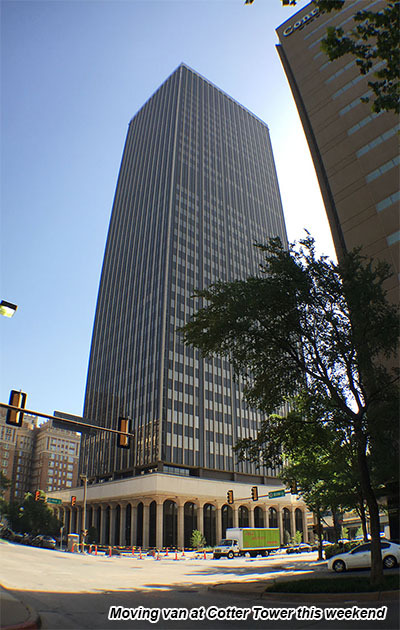 In 2009, City Center West was sold to a group headed by Mark Beffort which owns Leadership Square, Oklahoma Tower and Corporate Tower, among other nearby buildings. Beffort paid $7.62 million. As a part of Devon Energy's new headquarters construction, the company bouth the City West West garage and expanded it for their private use. The purchase price was $18 million. And in 2012, Sandrige bought the Broadway/Kerr Garage for $8.6 million. Ironically, amidst the downtown parking crunch that garage sits largely empty as SandRidge has laid off hundreds of employees over the last several years. Independent appraisal aside, does it make sense for the city to sell a paid-for property that generates millions in annual revenue that is ever increasing? Or is the sale simply one of forced necessity due to the desire to build a large garage for the convention center? Why is the convention center garage so important? When OKC citizens voted to approve the new convention center as a part of MAPS 3, it was pitched with a $252 million pricetag as part of the $777 million new MAPS budget. Later, representatives from the city and the Convention and Visitors Bureau – which books conventions on behalf of the city – argued that a large convention center hotel was vital to the success of the new facility. Originally it was estimated the city would need to provide a maximum of $50 million to a hotel developer. When Omni was finally selected from a handful of other applicants, it was revealed that $85.4 million in incentives would be the number. Additionally, Omni wanted all that money upfront which would require the city to spend millions more in interest fees. Omni also insisted on being allotted parking spaces in a structure to be built to the immediate east. They would pay market rent on the spaces but would not start construction on the hotel until the parking project was completely nailed down by the city. Just two weeks ago, the convention center began construction and the Omni should soon follow as the city had firmly committed to spend $35.4 million on the garage, after receiving $9 million from the general MAPS budget. 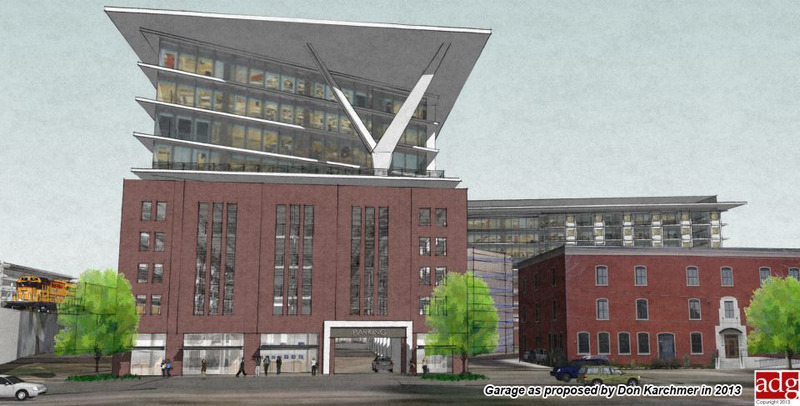 Now, the city is exploring the idea of making the garage even larger and local architecture firm TAP was recently commissioned to design the structure with the ability to expand. It seems that option was added once it appeared COTPA would be receiving the proceeds from the pending Santa Fe sale. Continental approached the city about selling Santa Fe last year, but their offer of $15 million was deemed too low. It was unsolicited and coincided with publicity over the city needing to free up capital to finance the convention garage and close the deal with Omni. As stated, court documents show BancFirst was notified of their winning bid on April 30th. It is likely they had started negotiating with the city even before this time. Also, just last week Enable Midstream announced they would be moving from Leadership Square to the new BOK Park Plaza in the middle of 2019. They further indicated they would be moving all of their several hundred employees from the Santa Fe Garage to one at the nearly-empty BOK complex in the next few weeks. City negotiations with Karchmer date back to at least 2013 when a garage with housing or office space was proposed on his own land but extending onto a large city tract. That deal completely stalled but is once again moving forward. When does BancFirst close on Cotter Tower? Assuming the court overseeing the Cotter bankruptcy approves the PSA in a hearing on July 18th, the Oklahoma City Bank would then have a 30-day due diligence period to indentify any significant issues that would cause them to walk away from the purchase without penalty. After the end of due diligence, the company would lose its escrow deposit if it decided to back out. An attorney familiar with the case and proceedings told OKCTalk that the likely closing date would be this September. Court documents indicate BancFirst plans to move its headquarters and banking operations from the building it currently owns directly west of Cotter Tower. Lawfirm Andrews Davis ceased operations this month and vacated their full-floor space on the 34th story this weekend, leaving the building only about half occupied. BancFirst would need only a small portion of that vacancy and those who evaluated the building for purchase told OKCTalk that it needs signficant investment due to deferred maintanence. Tenants that were interviewed last year complained of erratic temperatures, plumbing problems and a general lack of upkeep. It is expected that BancFirst would make significant renovations to the building, perhaps before making the move from across the street. Why are such matters kept from the public? This is the question being asked by at least one member of city council, pointing out that council agendas do not come out until the Friday before their Tuesday meetings. Often, the meeting docket contains hundreds of items. In addition to the garage matters, in the last two weeks two very large increases to the the city budget were approved with little advance notice and shortly after an exhaustive, months-long process was concluded before the 2018/2019 budget was formally adopted. First, the Boathouse Foundation was given $1.23 million from the general fund last Tuesday. There had been no mention of this before a MAPS 3 Board meeting last week where another $749,000 in MAPS funds were approved, citing a months-long evaluation by Alliance head Cathy O'Connor. Mike Dover of the MAPS 3 Board pleaded to table the motion until requests from other MAPS programs could be considered. Ultimately the funds were approved and the same was true by council this past Tuesday despite protests by Ward 2 councilman Ed Shadid. Scissortail Park was also awarded just under $3 million from the general fund in this past Tuesday's council meeting even though the park will not be open for business until the following fiscal year. It is not clear why this large budget item was not considered in the protracted budgeting process that was recently finalized. OKCTalk has questioned the Municipal Counselor on the practice of city officials meeting with voting members of committees in private before any of these allocation of tax dollars hit a public document. Oklahoma District Attorney David Prater said after a similar meeting of small groups by the Mustand Public School Board and Hobby Lobby founder David Green that such practice was highly suspect, especially if they were specifically arranged to avoid a quorum and thus public participation and if any one presenter attends more than one small meeting. The practice in Oklahoma City is to frequently have Jim Couch or Cathy O'Connor present information – usually regarding the payment of a specific amount of tax dollars for a particular purpose – to all members of a group in two or more meetings. COTPA held a meeting on Friday which included a detailed presentation of their budget for fiscal year ahead. There was no mention of these two parking deals anywhere on their agenda. Councilman Shadid was told the Santa Fe Garage item would be on the agenda for next Tuesday's council meeeting. 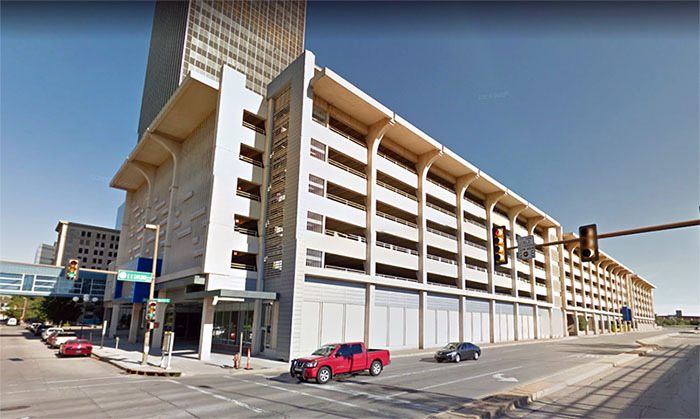 OKCTalk could not confirm whether the Karchmer Garage would also be presented at that time but it's approval is regarded as vital in BancFirst's purchase of Cotter Tower. Exact details and absolutely none the information reported here has appeared in public documents to date.